Cole Hamels agreed to terms on a contract extension with the Phillies that will pay him $144 million over six years. Looks like the biggest move of the trade deadline [puts on sunglasses] … wasn’t a trade at all. The deal is the second-largest ever for a pitcher, topping Johan Santana’s six-year, $137.5 million pact with the Mets and trailing only CC Sabathia’s seven-year, $161 contract with the Yankees. This is a market-value deal. Hamels will make the same annual salary as Phillies co-ace Cliff Lee, and he’s three years younger than Lee was when he signed his deal. It’s about $2.5 million more per year than the Giants gave Matt Cain in April, which makes sense, since Hamels was nearly four months closer to free agency than Cain was. And that’s what this deal was about: A preemptive strike against Hamels hitting the open market, where he might’ve been overwhelmed by offers from other teams. The Dodgers just agreed to give up a real prospect and pay nearly $40 million for 2⅓ years of a player who’s created multiple clubhouse distractions, can’t field, and hasn’t been a significantly above-average hitter since 2010 (granted, their lineup was one step away from bringing back Pedro Guerrero and Kenny Landreaux). What would have stopped them from shooting the moon for Hamels? The smart money would’ve been on them (or another team) to match or even top Sabathia’s record deal. For top teams who’d sought starting pitching like the Rangers, Angels, and others, this is a sizable setback. Hamels and Zack Greinke were the only super-elite starting pitchers expected to be available at the deadline. We might now see a bidding war for Greinke, or even for starters one tier down such as James Shields, Matt Garza, and Josh Johnson. Garza and Johnson play for teams who are already in full selling mode. But the Hamels deal could cause a chain reaction that prompts fringe contenders like the Rays (2½ games out in the chase for the second wild-card spot) to make trades with an eye to the future … or at least try to get creative while shopping a number-two starter. As for the Phillies, the big headline is the stars-and-scrubs philosophy they’ve adopted, especially on the pitching side. 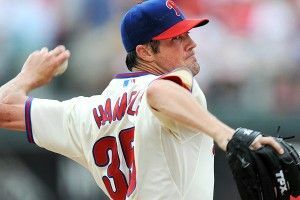 Though details of the Hamels deal were still being hammered out, Lee, Roy Halladay, and Jonathan Papelbon were already slated to make $58 million between them next year; year one of the Hamels deal could push that total to somewhere near $80 million. In other news, the Phillies sit in last place in the NL East. That doesn’t make GM Ruben Amaro Jr.’s strategy wrong, per se. The Halladay contract was universally hailed as a huge coup, with the Phillies dishing out a relatively modest three-year, $60 million deal to one of (at the time) the three or four best pitchers on Earth. Lee supposedly had a bigger offer from the Yankees, but signed for less at a time when he, too, was one of the truly elite pitchers in the game. Only the Papelbon deal looks out of place, and that has more to do with the inherently limited value of closers and, especially, managers’ inability to squeeze full value out of them (ask any Phillies fan about Charlie Manuel’s tendency to staple Papelbon to the bench late in tie games on the road, and you might get punched in the face) than it does any lack of ability on Papelbon’s part. The bigger issue for the Phils is their aging lineup, full of players who are past their prime or possibly on the way out. Ryan Howard is already hitting for power again after a nasty Achilles injury forced him to miss half the season, but he had his best season six years ago and hasn’t been even a three-win player since 2009. Chase Utley might’ve been the second-best position player in baseball from 2005 through 2009; he’s struggled with a rash of injuries and steady decline since then. Shane Victorino’s come down hard after a big 2011 season and is a free agent in two months. Hunter Pence is reportedly being shopped. Placido Polanco is just about done. The expected influx of talent from the farm hasn’t materialized, with some of it being flipped for veteran stars (rightfully so) and others like Domonic Brown failing to live up to their potential. In a weird way, what the Phillies’ big spending for pitching (as well as Ryan Howard’s $125 million contract extension) might’ve done is force them to double down. Add Utley and Howard to the four marquee pitchers and you’re at about $115 million for next year, for six players. But there will be some salary relief: Pence, Victorino, Polanco, and Joe Blanton combined to make about $37 million this year. Assuming Pence gets traded, all four will likely be off the books in 2013. If they’re going to try a run in the next few years on the backs of the three aces and the star closer, and they have that $37 million salary cushion available, expect the Phils to open the vault for a hitting star or two to try to make it all work. Josh Hamilton? Michael Bourn? Nick Swisher? B.J. Upton? A trade for David Wright? Get ready for a crazy offseason in Philly. Miami's Woes Result in Ramirez Heading to L.A.